Galicia is the Spanish region closest to the Portuguese home of Kartar and Bill. I would be particularly interested in visiting Santiago de Compestela. Santiago do Compostela was Christendom's third most important pilgrimage site after Jerusalem and Rome. If we do visit, I would love to stay in or close to the Praza do Obradoiro. Santiago De Compestela Turismo: The official web-site. Santiage De Compostela -- Wikipedia: An entry from the on-line encyclopedia. Hospederia San Martin Pinario: More historic accommodations in the centre of the city. Hill Fort Of Monte De Santa Tecla: An excavated Celtic village with some 100 round stone dwellings dating to c. 600-200 BCE are on the side of Monte de Santa Tecla near A Guarda in Pontevedra. The Museo de Monte de Santa Tecla is located close by. Hotel Convento de San Benito Historic: This hotel in A Guarda has ocean views and is in a restored medieval convent. Spain is home to some of the oldest cave paintings in the world, including the off-limits Cuevas de Altamira. Cuevo de Tito Bustillo: The Tito Bustillo Cave is just outside the town of Ribadesella. 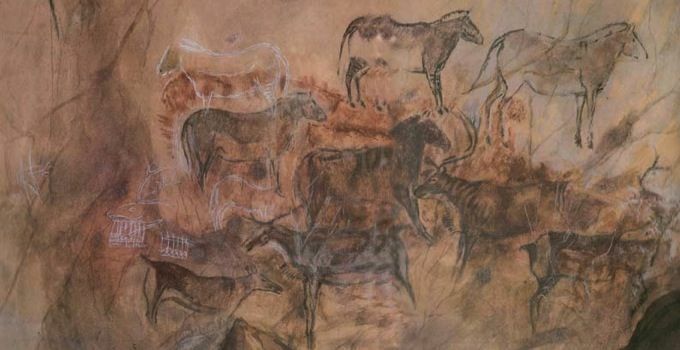 The prehistoric paintings date back to 18,000 BCE and include images of stags and horses. Only 360 visitors are scheduled per day. Tickets are given out at 10 am and need to be booked in advance. Cueva del Buxu: Located just east of Cangas de Onis, this cave has engravings and rock drawings over 10,000 years old. Reservations are needed. Only 25 visitors are allowed daily. DW lists the site as open Wednesday-Sunday (Tel: 608 17 54 67). Our Lady Of Covadonga -- Wikipedia: A statue of the Visigothic warrior Pelayo stands outside the basilica at Covadonga not far from where he and his small band defeated a Muslim army in 722 CE. The tomb of Pelayo in a nearby cave has been converted into a shrine, with the Virgin Mary also venerated for her contributions towards the military victory. Several historic towns are in this region, including Segovia and Salamanca. I have highlighted Avila as my top choice, in large part because of the Saint Teresa connection, but do not feel as strongly about Avila as I do about Toledo. Avila (pop. 59,000) is located 1,130 metres above sea level. Its medieval walls are perhaps the best-preserved in all of Europe. The town has a rich history, including as the birthplace of Saint Teresa. Avila Turismo: The official web-page for the town. Convento De Santa Teresa: A convent was built on the site of Saint Teresa's former home. Convento de la Encarcion: Teresa lived for more than 2 decades in this convent outside the city walls. Teresa is buried in the Museo Carmelitano In Alba De Termes, just outside Salamanca. Real Monasterio de Santo Tomas: A significant way from the city centre, this monastery contains the tombs both of Prince Juan, the sole son of Ferdinand and Isabella, and of Tomas de Torquemade, the most famous head of the Spanish Inquisition. Possible Place to Stay -- Palacio de los Velada: Located in a 16th-century palace close to the cathedral. Segovia (pop. 54,900) may have the most spectacular location of any city in Spain. Its cathedral was the last great Gothic Spanish church. Other churches include San Miguel, where Isabella was crowned Queen of Castile. Alcazar is at the city's western end. Segovia's aqueduct is the largest Roman structure in Spain. Salamanca (pop. 152,000) is a great Renaissance city and home to one of the oldest universities in Europe. Leon's (pop. 131,700) most famous building is its cathedral. The Royal Pantheon includes superb frescoes of Biblical and mythical themes. The Museo de Leon has an excellent collection. The Hostal de San Marcos was founded in the 12th century as lodgings for pilgrims on the way to Santiago. A parador there still provides accommodations. The tomb of El Cid (1043-99) is in Burgos Cathedral, another of Spain's grandest. There is an impressive Templar caste at Ponferrada. St. Dominic was responsible for building the Monasterio de Sango Domingo de Silos in the 11th century. The town of Tordesillas is where the the post-1492 colonial world was divided between the Spanish and the Portuguese. Penalba de Santiago is highlighted in guidebooks as a particularly picturesque village. Extremadura -- "the land beyond the River Douro" -- is one of Spain's wildest regions. It was the birthplace of a disproportionate percentage of Conquistadors. The Virgin of Guadalupe is the star attraction of the 14th-century Hieronymite Monastery of Guadalupe. According to tradition, a shepherd found a dark wooden image of the Virgin Mary here. The old hospital has been converted into a parador. The Plaza Mayor of the hilltop town of Trujillo (pop. 9,600) is one of Spain's prettiest. This was the birthplace of Francisco Pizarro, conqueror of the Incas. An Islamic fortress stands at the top of the hill. Pizarro's brother founded the Palacio del Marques de las Conquista with some of the proceeds of New World wealth. Possible Place To Stay: The Eurostars Palacio de Santa Marta is a former 16th-century palace. Merida has important Roman remains. The Museo Nacional de Arte Romano displays many Classical treasures. More than 40 dolmens -- megalithic burial sites -- are located on the edge of the town of Valencia de Alcantara. Charles V spent the last year of his life at the Hieronymite Monastery of Yuste. Madrid Province (the Comunidad de Madrid), as distinct from the city itself, is on Spain's high central plateau. In the western foothills is Philip's royal palace, El Escorial, and Franco's war monument, Valle de los Caidos. These sites are not far from Avila, Toledo or Segovia. Philip's palace/monastery complex is one of the most distinctive royal residences in European history. Philip's Seat: The king watched the building of the palace from this rock close by. Franco's tomb and war monument has been enmeshed in controversy ever since the dictator's death in 1975. Located approximately 13 kilometers north of El Escorial, its features include a 250 meter-deep basilica carved into the rock and a 150 meter-high cross. 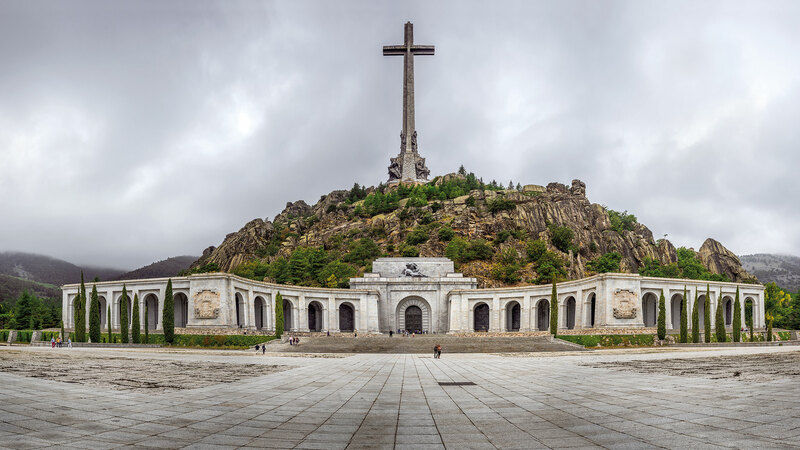 Franco's explicitly situated the memorial close to El Escorial, as he wished to fold it into his interpretation of both the Spanish and the Christian story. Some 40,000 soldiers from both sides of the Civil War are buried here, though there are many more Nationalists and the Republican bodies were moved without the permission of family members. The 20-year building project made heavy use of prison labor. The Socialist government has voted to exhume and remove Franco's body from the center of the basilica. That is scheduled for June 10, 2019. "Spain To Exhume Franco's Remains And Turn Site Into Place Of 'Reconciliation,'" Guardian, June 19, 2018. Raphael Minder, "Spain To Exhume Franco From Monument He Had Built," New York Times, September 13, 2018. Sam Jones, "'The Sooner It's Gone, The Better,' Says Former Prisoner At Site Of Franco's Tomb," Guardian, November 12, 2018. Monasterio de Santa Maria de El Paular: Founded in 1390 as Castile's first Carthusian monastery, today the complex includes a Benedictine monastery and a hotel. Chinchon: A beautiful small town with a porticoed Plaza Mayor. This is one of the less-visited Spanish regions. It has a rugged topography and scenic rural landscapes. High-speed trains connect Toledo with Madrid and Seville. Toledo (pop. 84,000) is on a hill above the River Tagus. A former Roman fortress town, Toledo became the Visigothic capital of Spain in the 6th century CE. In the Medieval era, it became famed as a city of monuments, with Muslim, Christian and Jewish cultures creatively fusing. Just southwest of Madrid, it is connected to the capital by regular bus and rail service. I recommend considering Toledo as the base for a multi-night stay, with the old Jewish quarter of the city as the preferred location. Toledo Turismo: The official tourism web-site (in Spanish). Toledo Cathedral -- Wikipedia: Built on the site of a Visigothic cathedral and a later mosque, this is one of Spain's most impressive cathedrals. Santa Iglesia Catedral Primada de Toledo: The cathedral's official web-site. Alcazar Of Toledo: Charles V built a palace on the site of earlier Roman, Visigothic, and Muslim fortresses. It was badly damaged during the Spanish Civil War. But it was then rebuilt by the Nationalists, who had withstood a long Republican siege and transformed into a symbol connecting the Nationalist forces to an earlier grand Spanish history. That historical narrative was supported through the moving of Spain's main army museum from Madrid to the Alcazar. Synagogue of Santa Maria la Blanca: The oldest and largest of Toledo's original synagogues, it was the site of a pogrom in 1391 and was turned into a church in the early 15th century. Synagogue of El Transito: Built in the 14th century, the former synagogue now houses a museum of Sephardic culture. Mosque of Cristo de la Luz: One of the city's two surviving Muslim structures, it dates from circa 1000 CE. Museum Of Santa Cruz: This Toledo museum is housed in a former hospital. El Greco Museum -- Wikipedia: See also the Museum Website. The museum is located in the Jewish quarter, near to the house in which El Greco lived. El Greco was born in Crete in 1541 and came to Toledo in 1577 to paint the altarpiece for the convent of Santo Domingo el Antiguo. He died still in Toledo 37 years later. His "Burial of the Count of Orgaz" is in the Iglesia de Santo Tome. "The Denuding of Christ" is in the Sacristy of Toledo Cathedral. Hotel Santa Isabel: Housed is a 14th-century nobleman's home, the hotel has a roof terrace with views over Toledo. For some booking information, see TripAdvisor. Loft In City Center: An Airbnb apartment in the Jewish quarter. Toledo Apartment: An Airbnb apartment close to the Cathedral. The idea of a mad quest for the windmills of Don Quixote has considerable appeal to me. Some exploration would be involved, but this would be an exercise in reading as well as travel. I could see finding an appropriate spot in the shade and then spending hours reading large segments of Cervantes's novel. Don Quixote tourism is, not surprisingly, a "cottage industry" on the plains of La Mancha. Of all the towns that claim a connection to the adventures of Don Quixote, El Toboso and Cmpo de Criptana probably have the strongest cases. El Toboso: El Toboso (pop. 2,200) was chosen by Cervantes as the birthplace of the protagonist's sweetheart Dulcinea. The Casa de Dulcinea was the home of Dona Ana Martinez Zarco, the woman on who Dulcinea is said to have been based. It has been refurbished in 16th-century style. See also Dulcinea Del Toboso House-Museum. 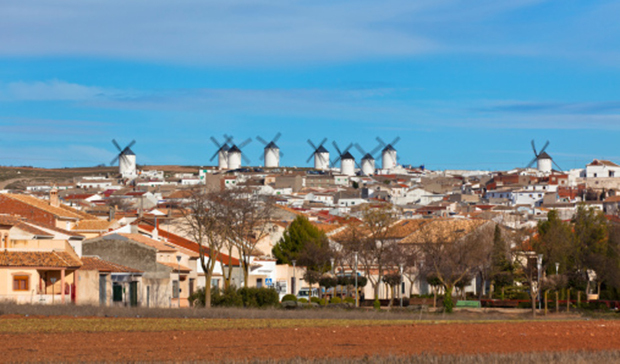 The windmills above Campo de Criptana are often said to be the ones at which Don Quixote tilted. An old restaurant at Puerto Lapice, 20 kilometers south of Consuegra off the A4, claims to where Don Quixote was "knighted" by the landlord. Alarcon: Alarcon is a well-preserved fortified village that dates back to the 8th century CE. It served as a military based during the Reconquest. Parador De Alarcon: The medieval castle has been converted into a state-run luxury hotel. El Toboso: Airbnb has a Double Room in El Huerto de Dulcinea. Most places in Spain have direct connections with Madrid. The stand tourist procedure is to take day trips from the capital to surrounding sites. Note that if we were in Toledo, Avila, or somewhere else in the environs, that we could reverse the m.o., and take a day trip to, for example, the Prado and the Museo Nacional Centro De Arte Reina Sofia. The Basques have a separate language; an extremely strong cultural identity; and a history stretching back tens of thousands of years. We likely will not want to push this far east. Noteworthy sites include Guernica and Bilbao's Museo Guggenheim. Jesuit history is rooted in the region. Saint Ignatius of Loyola was born in Santuario de Louiola, while Saint Francis Xavier was born in the 13th-century castle Castillo de Javier in 1506. The region is also connected to an earlier Christian history. The Way of St. James passes through Basque country. The 21.7 kilometers from Santo Domingo de la Calzada to Najera, for example, seems to be a traditional day leg in which the connections to the older pilgrim trail are still palpable. Guggenheim Bilbao: The museum web-site. Parador De Santo Domingo: This government parador dates from the 12th century as a hospital for pilgrims on the El Camino. Southern Spain was the last area to fall to Christian forces during the centuries-long Reconquista. Consequently, it is the area of the country where the legacies of Muslim rule are still the strongest. I am very interested in visiting Andalucia but am not sure it fits well with our schedule. I may return to Portugal for a few days or continue on down South before leaving for Turkey around May 16th. 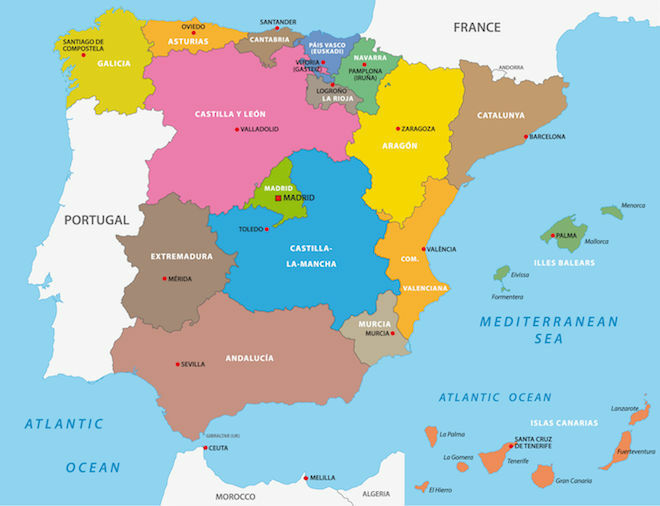 Andalusia -- Wikipedia: An entry from the on-line encyclopedia. The conquest of Granada (pop. 235,000) in 1492 brought all of Spain under the control of Isabella and Ferdinand, and served as the catalyst for both Columbus's first voyage and for the expulsion of Jews from Spain. Granada -- Wikipedia: An entry from the on-line encyclopedia. AlhambraDeGranada: Entry tickets for the Alhambra should be purchased in advance. Royal Chapel Of Granada -- Wikipedia: The Capilla Real contains the tombs of Ferdinand and Isabella. Terrace Alhambra: A budget apartment through Airbnb. A UNESCO World Heritage city, Cordoba (pop. 326,000) has a rich Roman, Visigothic, Muslim, Christian and Jewish heritage. Jose Fabia-Garrido, "A Local's Guide To Cordoba, Spain: 10 Top Tips," Guardian, August 6, 2018. New Apartment Close To Mosque-Cathedral: An Airbnb option. Seville (pop. 690,000) is the capital and largest city in Andalucia, and was the arrival point for the wealth of the Americas as it was transferred to Spain. Seville -- Wikipedia: An entry from the on-line encyclopedia. Fiona Flores-Watson, "48 Hours In . . . Seville, An Insider Guide To Spain's Steamy Southern City," Telegraph, March 14, 2019.